Beckel’s first novel, All Gone Widdun, won the Book Achievement award for best fiction in 1999, and her second novel, Dancing in the Palm of His Hand, is now taught in history courses at the university of Winnipeg and the university of Wisconsin. Based on historical records, Silence of Stone recounts the story of Marguerite de Roberval, a young French noblewoman. During a colonizing expedition to New France in 1542, she falls in love with a soldier. Jean-François de Roberval, commander of the expedition and Marguerite’s guardian, is so outraged at the disgrace she has brought upon the name Roberval that he abandons her, her lover, and a servant on the Isle of Demons, a small island in the Gulf of St. Lawrence. Marguerite survives, spending nearly a year entirely alone. More than two years after her abandonment, she returns to France, rescued from the island by a Breton fishing ship. 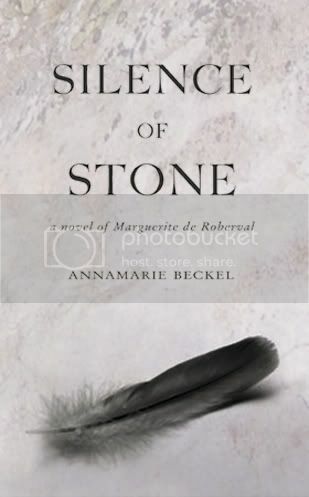 In Silence of Stone, Marguerite at 36 is an entirely different woman from the 18-year old abandoned on the Isle of Demons, so much so that she speaks of her younger self as “she.” Sixteen years after her return to France, relentlessly questioned by King François II’s geographer, André Thevet, Marguerite reluctantly recounts her life on the island.